The years from 1957 to 1970 were a curiously bipolar era for General Motors technologically: a fascinating, exciting, and sometimes puzzling mixture of bleeding-edge innovation and dogged adherence to the tried and true. On one hand, the corporation dabbled in everything from air suspension to rear transaxles, some of which would still have been impressive 20 years later. On the other hand, GM often abandoned those ideas almost as quickly as it introduced them. With rare exceptions, there was little on GM’s bread-and-butter products that would have puzzled a mechanic of the late 1930s. Of all the many production car and truck models GM offered between 1957 and 1970, only five strayed from the familiar pattern of front-engine, rear-wheel drive, and live rear axle (the Corvair, the Pontiac Tempest, the Corvette Sting Ray, the Oldsmobile Toronado, and the 1967-1970 Cadillac Eldorado). Only four GM cars sold in the U.S. during this period offered fewer than six cylinders — two, if we discount imports from Vauxhall and Opel — and none had more than eight. GM’s wilder innovations, like turbocharging and triple turbine automatic transmissions, were seldom offered by more than two divisions at a time and often lasted only a few years. To see the reasons for that schizophrenia, we need look no farther than GM’s 1966 E-body coupes, the Oldsmobile Toronado and the Buick Riviera (and their Cadillac cousin, the FWD Eldorado). The Toronado is widely considered a landmark automobile; not only was it the first American production car in nearly 30 years with front-wheel drive, its tidy “Unitized Power Package” managed to integrate FWD and big block V8 power in a way experts had insisted was impossible. By comparison, the conventionally engineered Riviera seems almost banal. However, far from being the lesser car, the second-generation Riviera was actually superior in a number of meaningful ways. This is its story. There’s a common misconception among automotive enthusiasts (and some automotive historians) that the moves automakers make from year to year are in direct response to market reaction: that the shape and features of next year’s model is dictated by customer response to this year’s car. The reality is that as much as automakers would like to respond that quickly to the public mood, the lead times involved in production tooling make it largely impossible. Even in the days before safety and emissions regulations, a major redesign usually took at least two years and involved a lot of expensive overtime, so for better or worse, automotive stylists, engineers, and executives of that era were often developing successors for models that had not yet gone on sale. Among the few exceptions was the emerging personal luxury genre created by the four-seat Ford Thunderbird. Because such cars were produced in comparatively small numbers, their production runs were longer than those of most family sedans (until 1970, the Thunderbird was on a three-year cycle) and annual facelifts were typically modest. The designers of personal luxury cars were still stuck with the same basic shape for the full production run, but they at least had the luxury of considering public response to the current model before finalizing its replacement. 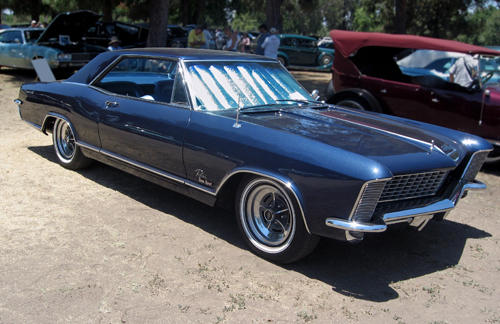 Development of the second-generation Buick Riviera probably began well before the 1963 model debuted on October 4, 1962. We don’t know exactly when the 1966 model was approved, but we assume it was around the spring of 1963, about the same time as the Oldsmobile Toronado. 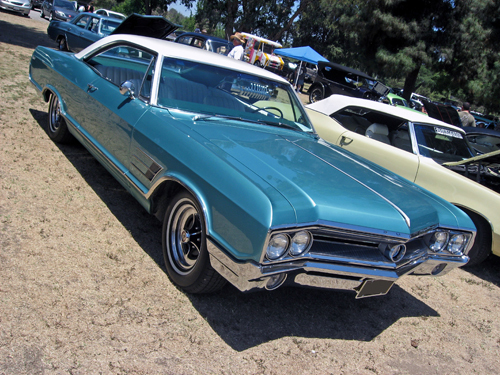 We must admit that we were not able to track down a lot of detailed information on the styling development of the 1966 Buick Riviera, but based on the chronology of its Toronado counterpart, we can make an educated guess that work began in early to mid-1962, months before the 1963 Riviera went on sale. If so, development began under the direction of Bernard N. Smith, then Buick chief stylist, but most accounts credit the design to stylist David R. Holls, who had been Charles M. Jordan’s assistant at Cadillac from 1957 to 1960, working on the 1959–1961 Cadillacs, and then in the Chevrolet studio until he moved to Buick in 1961. Holls would succeed Smith as head of the Buick studio in 1963. 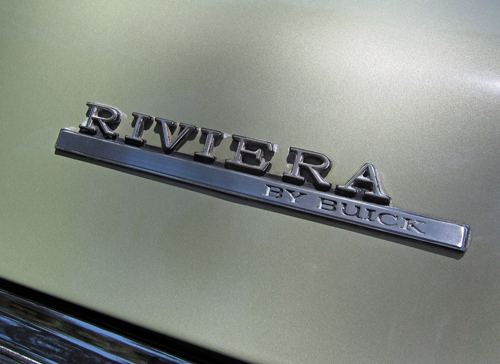 As we’ve previously discussed, the first Riviera did not originate in the Buick studio at all; it was developed by Ned Nickles (who, it must be said, had previously been Buick’s chief stylist) in a separate special projects studio, under the personal direction of styling vice president William L. Mitchell. The design was inspired both by the 1939–1940 LaSalle, which Mitchell had developed during his tenure as Cadillac chief stylist in the late 1930s, and the razor-edged roofline of a Hooper-bodied Rolls-Royce Mitchell had spotted on a trip to London. The design that emerged was quite sporty-looking, although it was bigger than the 1963–1965 Riviera in almost every dimension. With its kicked-up rear fenders and the pronounced “W” shape of its front end, the new Riviera also bore a stronger relationship to Buick’s forthcoming 1966 intermediate and full-size lines — probably an important consideration in its design. 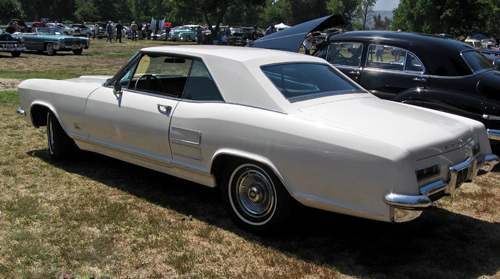 We wouldn’t go so far as to say the 1966 Buick Riviera looks like its Buick stablemates, but there was definitely a family resemblance to contemporary big Buicks like this 1965 Wildcat hardtop. Note, for example, the W-shaped nose with its vestigial hood ornament and the wasp-waisted flare of the rear fenders. Another factor in the development of the new model was pressure from senior corporate management to make wider use of the Riviera’s body shell. The first-generation Riviera would be basically sui generis; its chassis and running gear were similar to full-size Buicks’, but the body was shared with no other GM car. In General Motors’ thinking, that was an expensive luxury. The Riviera’s body was no less expensive to tool or build than that of the sedans, but the cost had to be amortized over a much smaller production run (in this case, 112,544 units over three model years). Although the Riviera was one of the top Buick models, Buick did not charge a substantial premium for it; the Riviera was priced within $35 of an Electra 225 convertible. As a result, the Riviera was probably less profitable than it might otherwise have been. GM’s usual answer to that problem was to share basic body shells across models and between divisions, a strategy the corporation had adopted back in the early 1930s. By the summer of 1962, months before the 1963 Riviera went on sale, Edward N. Cole, group vice president of GM’s car and truck group (and formerly general manager of Chevrolet), was pushing for Oldsmobile and Cadillac to introduce their own personal luxury coupes, sharing the “E-body” shell of the next-generation Riviera. This was not a popular decision: Cadillac (at least according to Chuck Jordan) was not terribly interested while both Bill Mitchell and Oldsmobile management wanted the Olds entry to use the smaller A-body intermediate platform. However, Cole insisted, presumably on financial grounds. While the basic proportions and fixed dimensions of the E-body would be dictated by Buick — in late 1962 and early 1963, the Advanced studio and Oldsmobile’s own designers adapted the Olds design to fit the Buick “package” — Cole wanted Buick and Cadillac to share Oldsmobile’s mechanical layout, which was to include front-wheel drive. (As explained in our Toronado article, Oldsmobile had originally wanted to use FWD in one of its sedan lines, but senior management had balked at the cost.) The engineering development of the FWD package and its associated pieces (including a unique powertrain subframe and new front and rear suspensions) was to be divided between the three divisions, under the direction of the corporate Engineering staff. Buick general manager Edward D. Rollert decided early on that Buick neither needed nor wanted front-wheel drive. Rollert had arrived at Buick in April 1959, following several disastrous years caused in part by quality issues and reliability problems with new technology like the ill-fated Flight Pitch Dynaflow transmission. He was well aware that he had been appointed to clean house at Buick, and we assume he was understandably reluctant to go down that road again. Buick would still contribute to the engineering of the FWD package, most notably by designing and manufacturing the Unitized Power Package’s slim planetary differential, but Rollert convinced Cole to allow the new Riviera to retain rear-wheel drive and adapt the cruciform frame of the first-generation cars to the new shell. 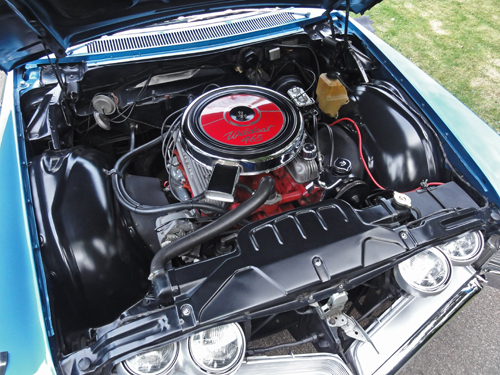 The ultimate first-generation Riviera was the 1965 Riviera Gran Sport, which included the dual-carburetor Super Wildcat engine, dual exhausts, a limited-slip differential with a 3.42 axle, and the inevitable badges and trim. Although commonly associated with the Gran Sport, the heavy-duty handling package with 15:1 fast-ratio steering was technically a separate option; models so equipped ride about 1 inch (25 mm) lower than cars with the standard suspension. On all 1965 Rivieras, the quad headlamps were concealed behind the grilles in the fender nacelles. This arrangement was part of the original design, but cost and engineering issues meant that the concealed lights didn’t arrive until 1965. The wheels are not alloys, but chromed steel, a $91.38 option available on most Buicks. That decision would make the Riviera and Toronado perhaps the most distinct of any of GM’s shared-platform models. It was common in that era for each division’s version of the corporate body shells to have its own frame, engine, and even transmissions, but the Riviera and Toronado would not only have completely different drivetrain layouts — they would also have different structures. 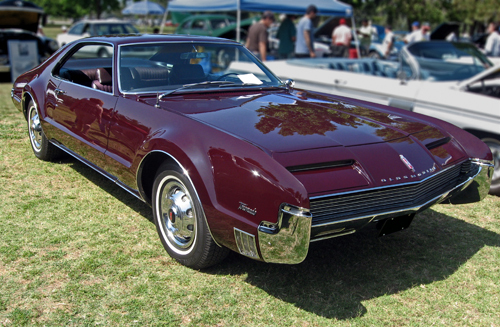 The Toronado (and the 1967 Eldorado) had a semi-unitized body carrying the powertrain and front suspension on a long subframe that ended just ahead of the rear suspension; the Riviera, despite sharing significant portions of the Toronado’s body shell, had a separate, self-supporting chassis. That chassis was another anomaly. Other than the big Cadillac Series Seventy-Five limousines, the Riviera’s was the last of GM’s X-frames, with no side rails. Buick had adopted the cruciform frame for its full-size models in 1961, creating a similar version for the 1963—1965 Riviera, but Buick was about to phase out that design for its big cars, which went to a perimeter frame for 1965. Aside from their obvious differences, the perimeter and cruciform frames represented completely different chassis engineering philosophies. Where the perimeter frame was deliberately flexible, allowing it to absorb vibration and road harshness, the cruciform frame was intended to be self-supporting. We suspect Buick’s main rationale for keeping the older frame was that it was already paid for, but combining it with the quasi-unitized E-body shell made the Riviera exceptionally stout. Remarkably, the Riviera was also 250 lb (113 kg) lighter than a Toronado Deluxe. In other respects, the 1966 Riviera would be largely conventional. Suspension was little changed from the 1963–1965 cars, featuring coil springs all around, unequal length A-arms and an anti-roll bar up front, and a live axle located by three trailing links and a Panhard rod. The drivetrain was also carryover: Buick’s familiar 425 cu. in. (6,970 cc) “Nailhead” V-8 linked to the excellent three-speed Super Turbine 400 (a.k.a. Turbo Hydra-Matic), which Buick introduced in 1964. One welcome returning feature was Buick’s big 12-inch (305mm) brakes, finned aluminum in front (with iron wear surfaces) and finned cast iron in back. They were not discs, which Buick wouldn’t offer until 1967, but as drum brakes went, Buick’s were among the best in the business. 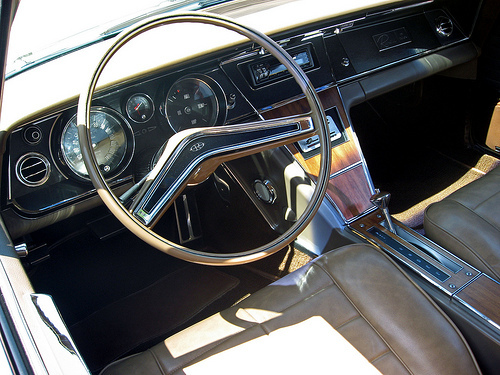 The 1966 Riviera’s only really novel engineering feature was its windows. Along with the Toronado, the Buick Riviera was the first postwar GM car to abandon the Fisher No-Draft ventiplanes introduced back in 1933. In their place was a modern flow-through ventilation system that Buick called Circulaire, exhausting cabin air through slots below the backlight. The loss of vent windows was controversial even within GM and would be often criticized in the years to come, but it started an industry trend. A key part of the first-generation Buick Riviera’s identity was its bucket seats and center console, seen above on a 1965 model (top). 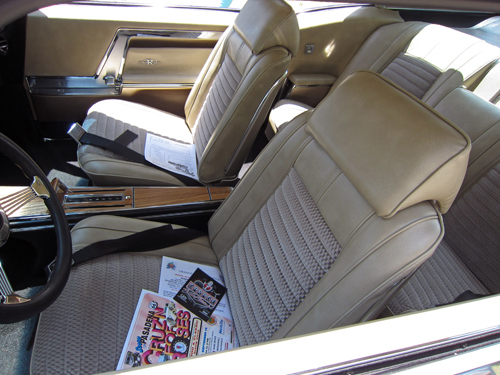 This 1966 Riviera (bottom) also has “Strato Buckets,” console, and console-mounted shifter, but they were now extra-cost options; the new Riviera came with standard bench seats. A split “Strato-Bench” seat with a folding center armrest was also optional. This car’s headrests were a pricey $84 option, which included a recline feature for the passenger seat.